Why am I limited to 10 ad accounts in trial? All trialers are allotted 10 ad accounts for the duration of the trial. Not to worry, once you upgrade all of our subscription packages include unlimited ad accounts. What is an Ad Account? Ad accounts include all advertising accounts associated with AdWords, Bing, Facebook, Twitter and LinkedIn. Only accounts that have been created in their respective networks and have payment method setup can be brought into AdStage. 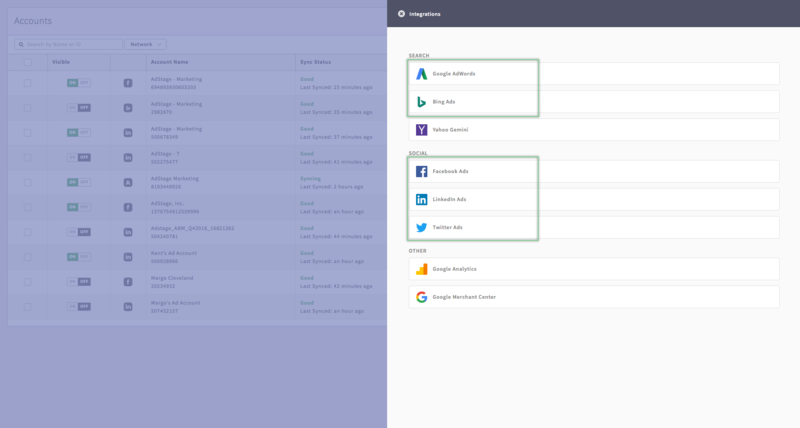 Google Analytics, Google Merchant Center, and Yahoo Gemini are not included as ad accounts and there is no cap to how many you can connect.